As with all Kimpton properties, the staff and management work hard to make guests feel at home. And the Saint George in Toronto, Kimpton’s first property in Canada and third outside the US, is no exception. 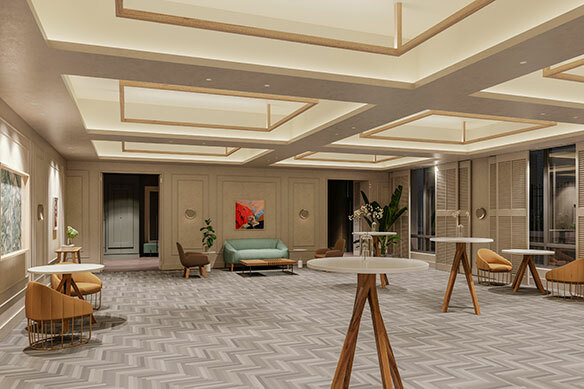 From the eclectic, locally-sourced furniture collection to the arched hallways to the living room-styled lobby, every detail is meant to ensure the guest experience is a comfortable one. The 14-storey building, formerly known as the modestly-priced Holiday Inn at 280 Bloor Street West, is currently undergoing massive reconstruction, as it prepares for its July 1 opening. At just 188 rooms, including 20 suites, and one event space on the garden level accommodating up to 100 guests, this hotel really is boutique. Kimpton, a design-led brand, is known for boutique-style properties that absorb the atmosphere of the neighbourhood in which they’re situated. “We want to be a part of the community, not impose upon it,” explains Bertrand Mangeot, General Manager, Kimpton Saint George. Entering the hotel, the living room is intimate. The central fireplace is accented with warm woods and earth tones that are found throughout the property. Guest rooms are modern, masculine, and clean-lined. An academic ambience with painted panelling and brushed brass details sets a tone of quiet comfort. Throughout the guest rooms and common areas, there will be upwards of 800 art pieces commissioned by local artists, including a one-of-a-kind marble moon in each bedroom. The Saint George has everything a modern hotel might, like impeccable service, strong WiFi, pet- and family-friendly suites, a (to be announced) gastropub, and second-floor fitness centre. The hotel also incorporates charming details you might not expect, like a record player in each suite and vinyl collection available to guests, a yoga mat in each room and yoga channel on demand, a nightly manager’s social hour, and a white squirrel figurine tucked into each closet – a nod to local folklore. Nestled between the trendy Annex and exclusive Yorkville neighbourhoods, the Kimpton Saint George is within walking distance to many of Toronto’s iconic attractions and convenient to the subway line. Located directly across from the Bata Shoe Museum, the hotel is also near to The ROM, Gardiner Museum, Royal Conservatory of Music, and University of Toronto. Rooms start around $300 per night, and average length of stay is anticipated at three nights. Agents can gain commissions when booking clients through their preferred reservation platform.